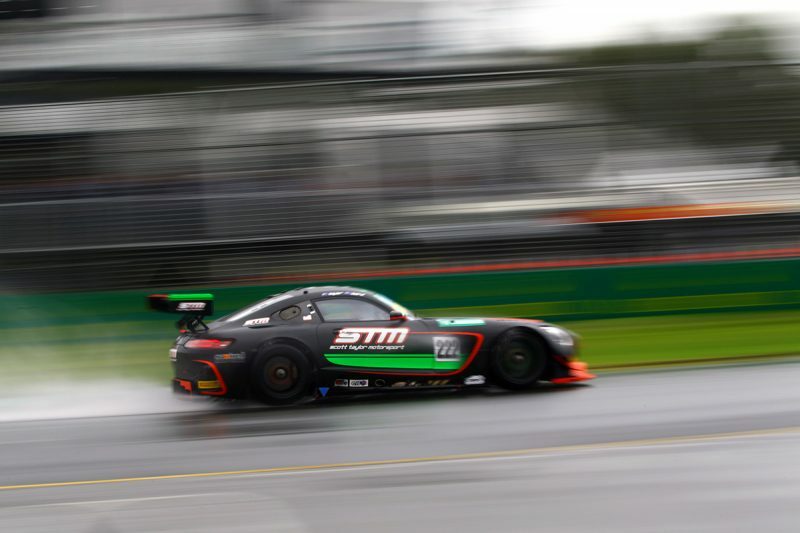 Craig Baird scored his second CAMS Australian GT Championship race win of the Australian Grand Prix weekend, leading the field to victory in a Safety Car hit encounter. Baird led the race from the start to finish, taking advantage of clear track and vision in the wet conditions ahead of Marcel Fassler (Jamec Pem Audi R8) and John Martin (Walkinshaw Racing Porsche 911 GT3-R). While the series usually employs rolling starts, the soaked conditions forced officials to run the field under Safety Car conditions for the first two laps of the race. Baird, in the #222 Scott Taylor Motorsport Mercedes-AMG GT, led the field through the first green flag lap, with the pack well behaved in the tricky conditions. Fassler made a half-hearted attempted to pass Maranello Motorsport’s Giancarlo Fisichella, before the 2005 Australian Grand Prix winner used his experience at the track to hold off the attack around Turn 5. The Audi driver passed Fisichella on the main straight on lap before trying to reel in Baird, with the Kiwi building a 2.9s advantage early on. While Baird and Fassler starred in the wet, Jan Jinadasa was the first to fall foul of the conditions, with his Lamborghini off the track at Turn 8 on the first racing lap. Martin moved his Porsche past Fisichella’s Ferrari 488 one lap later before a mid-race Safety Car on the fifth lap was brought out to clear the Audi R8 of backmarker Ash Samadi, who came to grief at Turn 10. The vehicle was unable to be recovered in time, forcing the race to be shortened to eight laps, with Baird taking the chequered flag under Safety Car conditions. Steve Richards took his Team SRM BMW M6 to fifth place in the wet ahead of Dominic Storey in the Eggleston Motorsport Mercedes-AMG GT and Fraser Ross’s McElrea Racing McLaren 650S. Dean Canto was a big mover in the few racing laps, taking his Trofeo Motorsport Lamborghini Huracan from 12th to eighth. Race 2 winner Jaie Robson (Aussie Driver Search Mercedes-AMG) was ninth. Nick Kelly was the top finishing car in the Trophy Class Audi R8 in 10th outright, while Justin McMillan claimed GT4 in the KTM X-Bow in 25th. Rama Danindro won the opening Ferrari Challenge race, which was run in the rain. Indonesia’s Danindro finished two seconds up the road from pole-sitter James Weiland and Renaldi Hutsoit. The conditions caused havoc throughout the race, with Safety Cars early and late in the piece. Australia’s Martin Berry finished seventh and New Zealander Grant Baker 22nd, while the other Kiwi David Dicker was a DNF.